Give me back my sanity, talking fish! 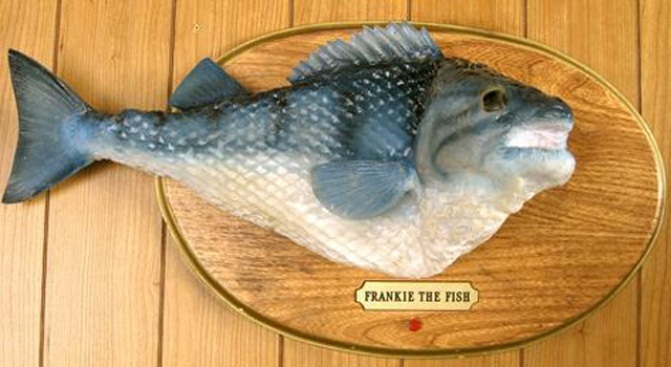 Curse you, Frankie the Fish. If you haven't been singing this catchy fish tune for days, you will now. Now just try to make it through the rest of the day without singing, "Give me back that filet-o-fish, gimme that fish!" The McDonald's ad has been playing nonstop on TV lately, coinciding with lent, and it's as addictive as a super-sized No. 2 Value Meal. The ad and its infectious song have spawned a series of knockoff ads posted online and a ring tone. Google says searches for "McDonald's fish" are up 100% in the past four weeks and that the ad has been viewed on YouTube more than a million times. Damn you, McDonald's, for putting this jingle in our heads! But at least we're not alone. As a fan of everything '90s, I was already the perfect demographic for an ad starring Big Mouth Billy Bass. But as soon as he opens his mouth and begins singing, I find myself transfixed, unable to look away, and pretty much at risk to follow any instruction that freakin' fish gives me. Eat at McDonald's every day? Convert to Kabbalah? Take a special trip to visit the Prime Minister of Malaysia? You got it, filet-o-fish, because I cannot take my eyes off you! Behold the entrancing "beep-boop" of the jingle's electronic base line, the angelic choral "aaahhs" punctuating each phrase of the song, and the intoxicating voice of the fish itself which sounds like a studious-yet-funk-infused version of Kermit-the-frog. The fish beckons you with its siren-call of plaintive melodic exhortations. And now, a Rochester newspaper may have the catch of the century. A reporter tracked down the "songwriting genius" behind the jingle. How is Joey Auch dealing with his newfound fame? "I don't see it as a stunning creative achievement," he told the newspaper. "I've been pursuing serious songwriting for 15 years. It's just ironic to do this crazy thing and have it blow up." According to the Democrat and Chronicle, Auch plays in a band called The Eleven Foot Seven, and a song he sung was played over the closing credits of Scrubs, so he's got some musical chops, so to speak. But to be forever known as that talking fish that he describes as sounding as "if David Byrne were a fish, crossed with Anthony Kiedis?" "People hear our music and say, 'Oh wow, you have a nice voice,'" he told the paper. "I don't know if I want to go down in history as the fish. But at this point ... I'll do it." And that is a fish tale you just can't make up.